Rupture is a video piece exploring the association of the photographic blur with the invisible blur of wireless information. 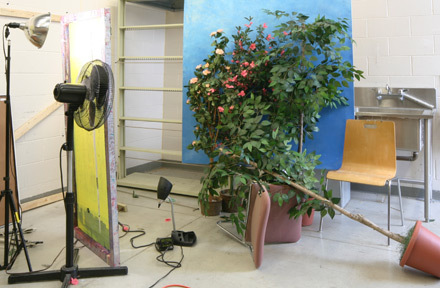 Bringing together information aesthetics, locative media and digital photography, Rupture features an unpredictable, aleatory camera that moves across lush, tableau-like photographs of artificial foliage developed from a home-built digital scanner camera (where the focal plane is "exposed" in a series of linear motions, over short intervals of time). At a distance, the resulting colour-saturated almost hyperreal images appear painting-like, as in a pre-Raphaelite tableau. Zoomed in, however, the streaking artifacts and the pixilated blurs ensuing from a digital camera registering motion (what the computer considers visible defects or loss of information), steer the viewer from any kind of romantic interpretation. Here, the tension between the painterly quality and the digital technological imprint questions the conceptual basis of how we read the out-of-focus in photographic images. 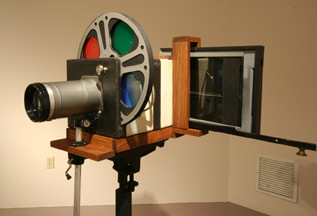 Moreover, the subversive integration of FBI developed surveillance software is what dictates the erratic, arbitrary movements of the video camera through the still photographs: local wireless Internet traffic on a laptop was recorded, then processed and translated it into a visual language which prescribed the trajectory of the video camera movements over the photographs. Rupture, through the interplay of the moving and static image, unsettles the focus: no longer can the eye contemplate the depth of the painterly photographs or try to discern the shapes beneath the pixilated blurs. 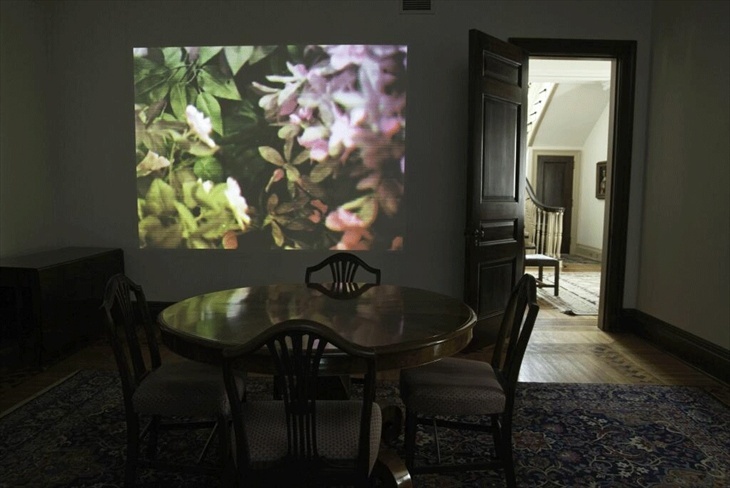 Instead, the invisible blur of information is made visible through volatile camera movements that force the viewer's eye to shift strangely across the screen: perception flounders, inundated by technology and artifice.